Jaboulet has one of the longest histories of any winery or negociant in the world. Originally founded in 1834 by Antoine Jaboulet in the Northern Rhone Valley, the company is currently owned by the Frey family who count numerous wine properties in their holdings. In Bordeaux, they own Chateau La Lagune. In the Rhone valley, they have holdings in Chateauneuf du Pape, Cornas, Crozes Hermitage and Cotes du Rhone. They market red and white wines. Jaboulet acts as both a negociant, as well as a wine producer. Paul Jaboulet is clearly capable of producing some of the top wines on the world! The terroir is there. 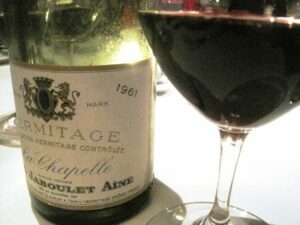 1961 Jaboulet La Chapelle is one of the world’s greatest wine tasting experiences. It’s a legend among wine collectors. It’s been scored 100 Pts by Robert Parker. We scored the famous 1961 Jaboulet La Chapelle 100 Pts as well! In fact the 1978 and the 1990 have also scored 100 Pts from us. All three vintages of Jaboulet La Chapelle hit the magic, triple digit number from Robert Parker. However, the domaine went through a weak period following the 1990 vintage. The quality of wines being produced dropped following the 1990 vintage. Who knows what caused it. It was probably the death of Gerard Jaboulet. It as not until after the Frey family bought the domaine that quality returned. 2003 was a rebirth vintage for La Chapelle. In late 2014, the Frey family continued adding to their holdings when they bought Chateau de Corton Andre in the Cote de Beaune area of Burgundy which included 7 hectares of vines. 2007 was strong and 2009 is sublime, however 2010 Jaboulet La Chapelle is probably the best vintage of La Chapelle produced by the Frey family yet. But that could change with the 2015 vintage. The best vintages of Jaboulet La Chapelle are: 2018, 2017, 2016, 2015, 2012, 2010, 2009, 2003, 1990, 1989, 1985, 1978 and 1961.Jaboulet La Chapelle is one of the world’s best wines for cellaring, so it’s quite possible that Jaboulet La Chapelle from the 1950’s, 1940’s and even older could be stunning, if well stored. 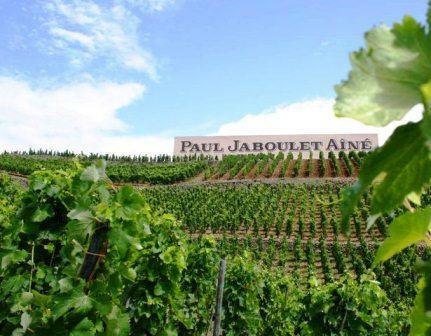 Paul Jaboulet is one of the largest land owners in Hermitage with almost 22 hectares vines planted to Syrah in Hermitage. The vines are distributed over various lieux-dits with their biggest section of vineyard land located on the famous Le Meal vineyard, with 6.8 hectares of vines. Bessards is their second largest holding where they own 2.6 hectares of vines. They also have vines in Greffieux, Rocoules and other vineyards in scattered in the Hermitage appellation. If you did not know, La Chapelle is not a vineyard. It’s a trade marked name. 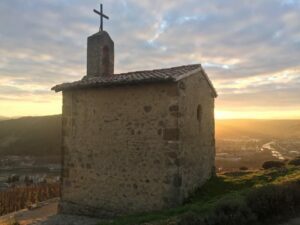 It takes its name from the small chapel of St. Christophe. The fruit is sourced from Bessards, Le Meal, Greffieux and Rocoules. To produce the wine of Jaboulet La Chapelle, the grapes are 100% destemmed and are fermented on a parcel by parcel basis. The amount of new, French oak used to age the wine varies from vintage to vintage, depending on the character and quality of the harvest. The wine is full bodied, concentrated and with expressive black fruit and leafy, earthy and iron scents. Typically, Jaboulet La Chapelle requires a decade or two to become civilized. The wines from the best years can age 30-40 years. One of the reasons for the continued improvement of Jaboulet La Chapelle is the draconian selection for the wine. Previously, up to 7,000 cases of wine were produced. But today, the average annual production is closer to 2,000 cases per vintage of Jaboulet La Chapelle. Paul Jaboulet Aine Hermitage when young, should be decanted at least 2-3 hours, give or take, allowing the wines to soften and open their perfume. However, Jaboulet La CHapelle in its youth can easily use 3-5 hours of decanting. Older vintages might need very little decanting, just enough to remove the sediment. Paul Jaboulet Aine Hermitage is usually better with 10-12 years of cellaring and should be at its best between 10-25 years of age. Paul Jaboulet La Chapelle needs 15-20 years of cellaring in the good vintages and is best between 20-60 years of age. Jaboulet Hermitage is best served at 15.5 degrees Celsius, 60 degrees Fahrenheit. The cool, almost cellar temperature gives the wine more freshness and lift. Jaboulet Hermitage is best served with all types of classic meat dishes, veal, pork, beef, lamb, duck, game, roast chicken, roasted, braised and grilled dishes. Jaboulet Hermitage is also good with Asian dishes, hearty fish courses like tuna, mushrooms and pasta. The white wine of Jaboulet is best served with a myriad of different seafood dishes, shellfish, crab, lobster, sushi, sashimi, chicken, pork and veal, as well as Asian cuisine. Jaboulet La Chapelle is one of the world’s great wines. In the best vintages, the wine needs 20-30 years to soften, develop and show it’s unique character. But from personal experience, I can tell you, it is worth the wait!